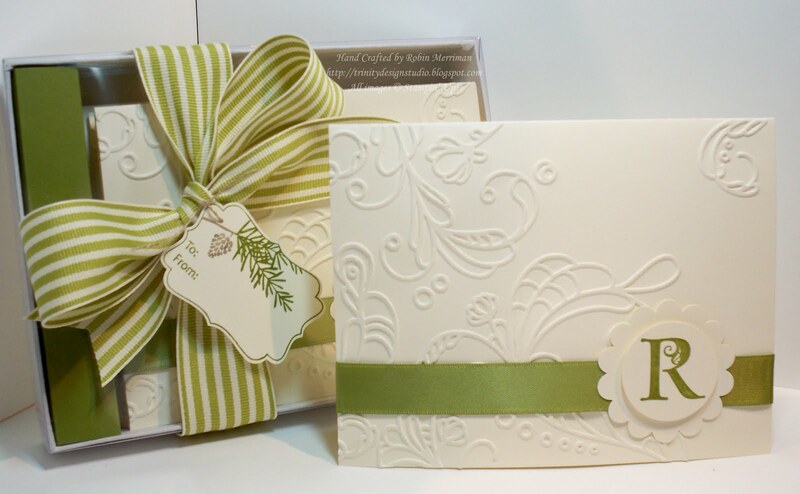 Trinity Designs: Monogram Note Card Set - New Class Offering! It's been a very busy family day around here today and I'm just now getting around to posting for you! Sorry about that! But, when you see what I have for you, you might just forgive me. AND you have a chance to make some in my new Monogram Note Card Class! Do you not just LOVE these?!! Last month I attended a Stampin' Up! 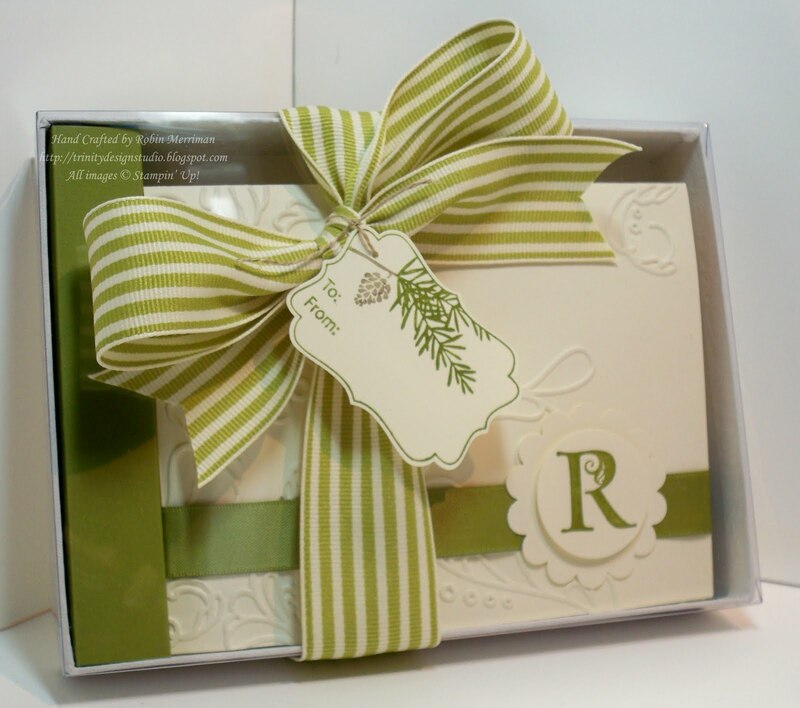 meeting and my upline shared a terrific idea for monogrammed note cards. So, since I loved it that much, I designed my own set, bought special clear cover boxes and decided to offer it as a class for YOU! Sign up for just one session or both! Each session will include all the materials to complete TWO sets of 6 monogrammed notecards, with envelopes in the decorated box! All for just $18! And in only an hour and a half! I love how elegant these are; they are perfect gifts! And best yet, you will even be able to choose from several different colors! This class is just what you need for beautiful, personal, handmade gifts for anyone on your gift list. You can even keep a set for yourself! To rsvp for the class, send an e-mail to me at stampwithrobin@yahoo.com to hold your spot in the class. Each class is limited to just 10 attendees. You can then send me your 50% deposit once you are on the list. I'm so excited to be able to offer you this great gift as a class this year! I can't wait to make these with you! gorgeous!! Does the ribbon wrap all the way around the front? I love the monogram card set. A great class idea. Such beautiful elegant, simple cards!! TFS! These are gorgeous. What a great gift idea! Could you tell me where you bought the clear boxes? I would love to make some for the holidays. Thanks.